You need to know how to improve CTR of Adwords ads and other PPC advertisements in order to lower your Adwords CPC and to actually make people click your advertisements. And you need to know how to organic CTR to improve Google search position and get people reading your articles. Good news is this: you can improve organic CTR and Adwords CTR by editing your headlines. One of the best things you can do for your website is to properly edit blog posts. When you edit your blog, the number one priority is to improve your headlines. And the CTR of Adwords ads and other PPC advertisements is one of the main criteria for determining your Adwords advertisement’s cost-per-click and ad ranking position. How can you improve the CTR of headlines so hat your blog traffic increases? That’s why it’s worth having a certified Adwords expert and SEO expert like myself look at your headlines. Or you can go-it-alone and edit your own headlines, which I’m about to help you with. Titles are so important to SEO that you should consider them long before actually writing the article. The title should be chosen while planning the blog post. Today, it is not so important to put keywords in a headline from an SEO perspective. Why did Google change this? Simply because it is too easy to influence the SERPs (Search Engine Results Pages) by writing a few choice keywords. What is more important is CTR (clickthrough rate). The average CTR for an Adwords ad is around 2% depending on your industry (for more on this read Wordstream’s article). 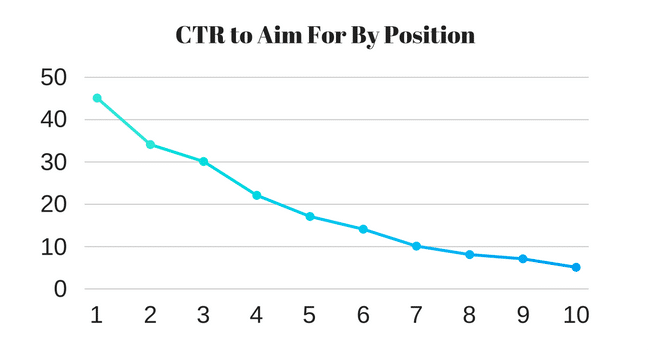 The average CTR of blog posts depends on search position. After analysing the sites that I personally work with, I have found the following to be key benchmarks. These are averages. Remember, our aim is to shoot above these. Therefore, aim to increase CTR by 20% of the average value. This is not an exact science. 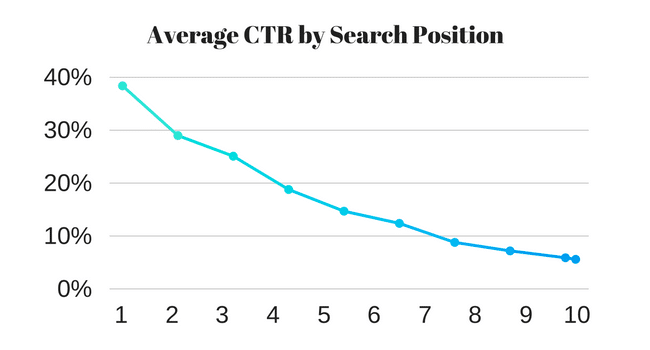 What matters is that we hit above average CTR for each search position. That way we move up the Google positions. CTR matters to ranking. Makes sense. The ultimate aim of your headline is to get a high CTR in SERPs (and on social media pages etc). This makes headlines a psychological issues. Because by definition a high CTR means a human is choosing to click on our headline in the search results pages. We’ll look at how we can use human psychology to increase CTR in just a moment. We’ve all seen those ingenious headlines of Buzzfeed, Upworthy and other viral websites. Those guys know precisely how to write titles that get a high CTR position. 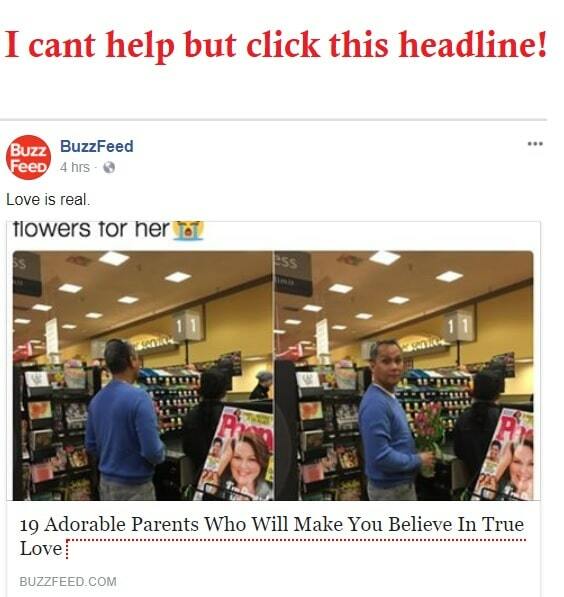 Take a look at this Buzzfeed headline. CTR rate went through the roof on this one. It is vital to write a good headline on social media posts. In fact it is even more important here than on Google and other search engines. When someone comes to your site via Google they already know what they are looking for. So provided your title fulfills their expectations there is a good chance you will achieve a good CTR. On social media people are not looking for any specific. Therefore, you need to hit them with a powerful headline so they stop scrolling and actually click your headline. Social media headlines are all about promise, emotions, sensationalism, and curiosity. We’ll look at these factors below. For now, we simply need to recognise that on social media headlines are massively important. While you’re improving your CTR you still need to remain truthful in your headline. Headlines massively effect visitor expectation. To succeed online you need visitors to interact with your blog and to spend time on your site. A huge part of that is setting high expectations. We need visitors to expect high quality content so that they are motivated to engage with the content. And one of the best ways to do that is by writing a good headline for blog posts. Just some basic tips on writing a headline, yeah? Which would you click on? The second one, of course. Why? Because the second one sets expectations. It promises something valuable. And (importantly) it says that someone else has actually done this already and it worked (the author of the headline has done the thing the reader is trying to do). Increased conversion rate (because your visitors are suddenly a lot more interested in what you do). Take a look at my guide to writing headlines that generate clicks. It shares all the best tips on generating a high CTR from good post titles.and most of those tips you can apply to improve your CTR for Adwords ads and other PPC advertisements. Writing a good headline is vital the first time you publish your post. However, I also highly recommend going back through your old posts and editing headlines for them. Am I right in thinking that a lot of your traffic comes from articles that have been around for a while? Months? Maybe years? 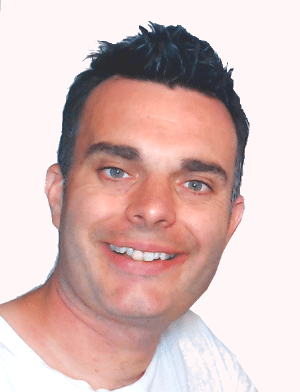 Do you want to increase traffic to old blog posts? If so, you should definitely go back and edit your headlines. Using Webmaster Tools you can analyse the performance of your headlines in the SERPs. Then, you can find the titles that are achieving high clickthrough rates, and those that aren’t. You can use the data to improve your overall title writing. And you edit the blog posts with low CTR to boost traffic to those old posts. Here is how to do precisely this. In this step we download the search analytics data so we can see which titles are getting a good clickthrough rate in Google search and which are not. 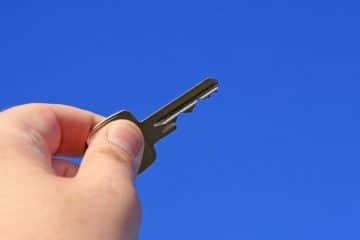 Go to Webmaster Tools and select the property you want to work on (read Kissmetrics Beginners Guide To Webmaster Tools if you haven’t already done this). You should now be looking at the page “Search Analytics” which will have data showing your clicks, impressions, CTR, and impressions. Download a copy of the data by clicking the “Download” button at the bottom of the screen. Save as either CSV (for Mixrosoft Excel) or google Docs. If possible, choose CSV as the rest of this guide will be written as though we are using Microsoft Excel. In this step we separate the pages with high CTR from the pages with low CTR. We will then get a good idea of what is working and what isn’t. This is highly valuable when it comes to editing blog post headlines. 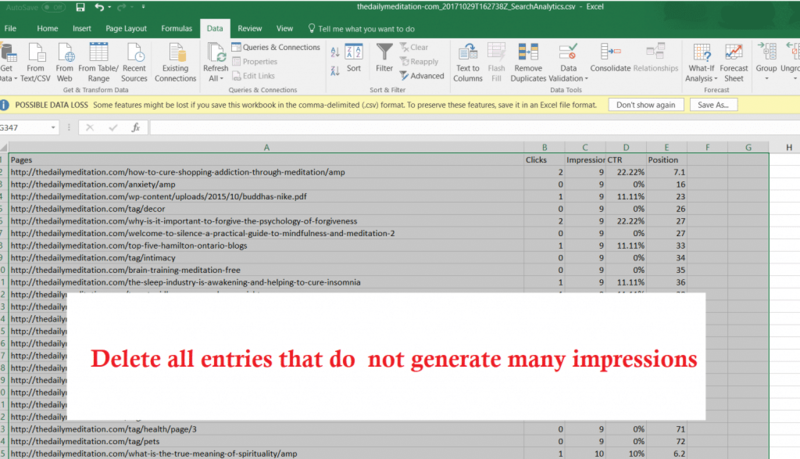 Open your Search Analytics data in Microsoft Excel or another spreadsheet editing software. Select all the data (CTRL + A). Select the Data tab at the top. This will open the SORT dialogue box. On the “Sort by” option, select IMPRESSIONS. And on the “Order By” option, select “Lowest to highest”. Press OKAY. Select all rows with a low number of impressions. Pages that generate less than 50 impressions are useless. Delete them. Now return to the SORT dialogue box. Sort by CTR, organised by Low to High. The top rows are now the rows with bad clickthrough rates. Cut them and paste into a new Excel sheet. Save this sheet as “Low CTR”. You now have two stylesheets. One stylesheet shows your pages with the highest CTR (which is a great indicator of good titles). The other shows pages with low CTR (which is a great indicator of a low quality blog post tile). Time to analyse those blog post titles. Open the stylesheet you just created—the stylesheet that has all your pages with high CTRs. The next step is to analyse what pages are working. That way we will learn what makes our visitors click. This is huge. Why? Well, it’s easy to create a blog post title that is okay. But to write a great post title we need to market to the demographic of our blog. Different people like different titles. The person who clicks on a Buzzfeed title probably will not click on a New York Times title. Totally different psychographics are involved. You need to know what makes your demographic click on your blog post titles. And the only way to do that is by looking at your search analytics. What type of language gets a high CTR? Different people respond to different styles of writing. A CEO will probably respond to results-driven language that focuses on facts and figures. Other people will respond to highly emotional language that sparks an emotional response. What type of language has your audience responded to? Take a look at your blog posts titles in your spreadsheet (you will need to open the URLs to see the titles). 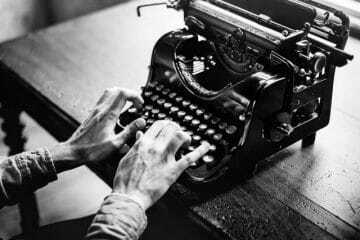 Consider the style of language, complexity of writing, the personality and voice. All these elements influence user behaviour. Make notes of the style of language that works for your demographic. What type of promises and benefits get clicks? We all know that we should mention (or suggest) the benefit someone will get from reading our blog posts. If we are helping them to make more money, we need to say so. If we are going to give them an emotional response, we should show it in the title. There are lots of different types of promises. Make people fitter / happier / healthier / more productive. What type of benefit do people respond to? Use those benefits in future posts. I mentioned this above. But it bares repeating. The complexity of language is a huge issue when it comes to writing blog posts. Different people read at different levels (and if your blog caters to young people or people for whom your writing is in a second language, then some of your readers will have low reading levels). Bottom line: make sure people actually understand you without needing a dictionary. What type of emotions gets clicks? We all know that emotional headlines get more clicks. But what kind of emotions should you use? The answer depends on your blogs psychographics. For instance, I write a blog on conscious living. All my readers are very interested in helping the planet and helping other people. If I write a headline that is compassionate and that creates a strong desire to help someone I know there is a big chance of the blog post getting a high clickthrough rate. But that’s just for my demographic. What emotions have worked for you in the past? Use them more often. . The human brain is obsessed with minimising energy expenditure. People want things fast and easy. And that even extends to a blog title. If your blog title is too long, people will give up before the end of it. Yes, it’s ridiculous. Because at most a blog title is one sentence. But people tire easily. How long should a blog post title be? The length at which you induce optimum curiosity with zero boredom. For a kid’s blog that might be five words / 20 characters. For a high-brow newspaper or research journal it would be much longer. What length of title has been working? Write to that length. Above I said that “content keywords don’t matter so much in 2017”. But here I am talking about a different kind of keyword. These keywords are words that make your psychographic go nuts. People are sensitive to certain types of word. The word “cancer”, for instance, is pretty major across the board. Writing for a weight-loss publication? If so “thin” is a huge word. Writing a blog on blogging? “Increase traffic” is a buzz-phrase. Ii write for a spiritual publication. To that demographic, “Enlightenment” is a very powerful word. What words get your audience clicking? Use them. What overall personality do your successful posts have? A title can express a great deal of personality. Woah! My CTR just leapt 5%. I only changed 1 thing! These titles could be used for the same topic. But not for the same blog. Why? Because a blog has brand personality, and a title needs to reflect that personality. Take a look at your successful blog titles. What personality has worked? How could you use that in future? What style of language do you readers respond to? How complex is the language? On average, how many words per headline? What benefits do readers respond to? What emotions do readers respond to? Do they respond to direct questions? How important are facts and figures? What keywords get people clicking? What personality do successful headlines have? Answer these questions to reveal your ideal post headline formula. We now know precisely what headlines get high clickthrough rates in search results pages. And we know how to write headlines that make people click. Using this info we can edit old blog post titles so that our old posts get more traffic. Compare this headline to your high-CTR headlines. Use the questions above. Isolate the problems with the headline. Consider: the promise the headline makes, the benefit to readers, the emotion, complexity of language, and of course the basic spelling and grammar. Edit this title so that it matches the points above (the points we analysed from our high-clickthrough rate pages). Rewrite the post headline 10 times. Choose the headline that works best. Return to Google Webmaster Tools. Go to Your Property > Crawl > Fetch as Google. Enter the URL and click Fetch. Then Submit. Using the steps above you will definitely increase your CTR significantly. And this will improve ranking in Google. Sometimes you will still not be 100% confident which title is the best for any given blog post. This is where split-testing a blog post title can help. Split testing is where various forms of the same post are shown to different users. Visitor 1 sees title 1. Visitor 2 sees title 2 and so on. This is an easy, effective way of testing blog posts after you publish. If you are using WordPress CMS, install the plugin Title Experiments Free. This is one of the best plugins for copywriting. I highly recommend it. Under the blog posts title bar you will see the option +Add New Title. Use this to enter three different titles. You will now be able to see the CTR of different blog post titles and to choose the most successful one. 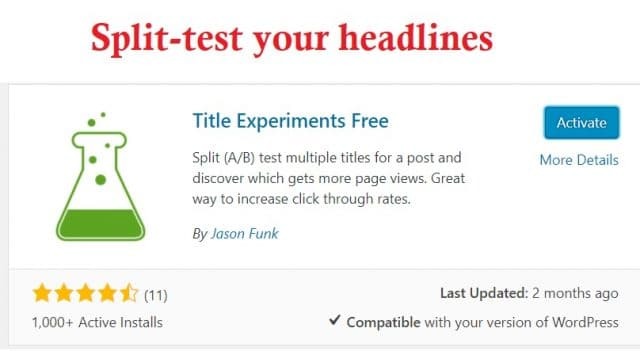 Split testing in this way will help you to select the best title for a blog post. And it can also offer valuable insight when you want to learn to write better titles for your blog. With a great title headline you will increase organic CTR and improve user engagement. You’ll get more traffic to your blog. And you will increase user engagements. And by writing great headline for advertisements you will not just improve CTR of Adwords ads and other PPC ads, you will improve ad rank and lower CPC.